In the heart of David Thompson Country along the front ranges of the Canadian Rockies, join instructors Royce Howland and Olivier Du Tré, with special guest Costas Costoulas of Calgary’s Resolve Photo, for an unforgettable time. From concept to capture, from development to printing, this five-day masterclass is dedicated to improving your mastery of digital black-and-white photography and printing. 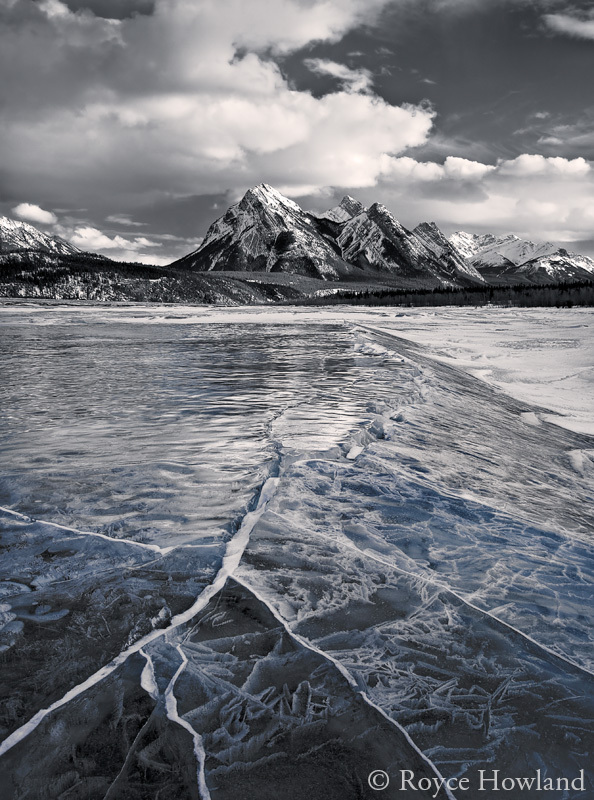 Secrets of the Ice World 4, Abraham Lake. Copyright © Royce Howland. 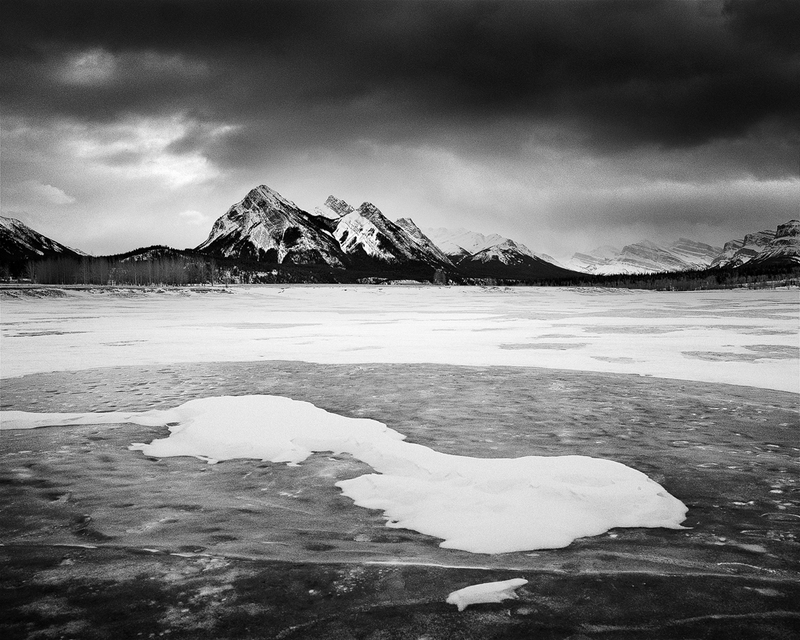 If you would like to improve your mastery of digital black-and-white photography and printing, the Winter 2014-5 Monochrome Masterclass is for you! We have the combination of location, learning format and instructors to give your digital B&W print work a great kickstart in 2015. Abraham Lake Ice Flowers. Copyright © Olivier Du Tré. We start with the base for our workshop: Aurum Lodge an award-winning eco-tourism lodge on the flanks of Abraham Lake in David Thompson Country. The lodge is ideally positioned to enable our group to make the most of each day. Our hosts Madeleine and Alan Ernst create a warm, friendly and welcoming atmosphere. 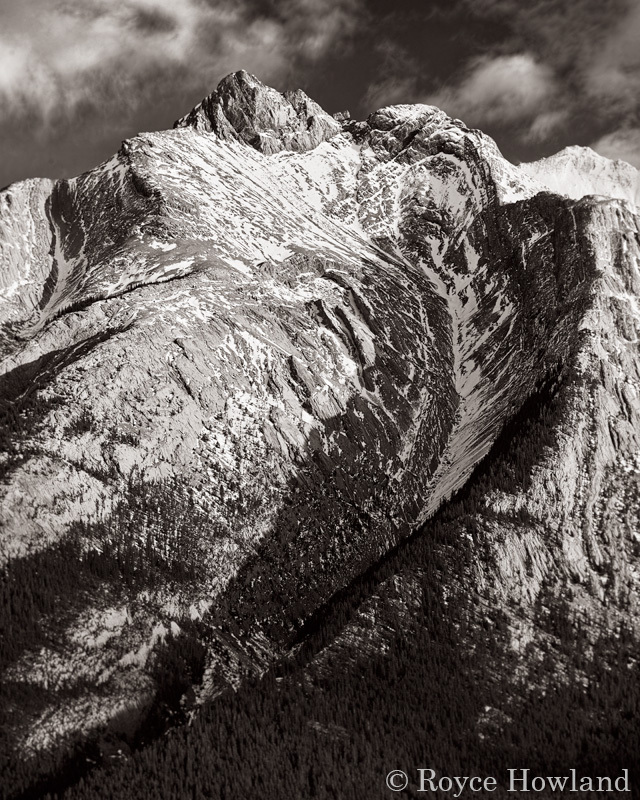 The Canadian Rockies are one of the most beautiful mountain regions in the world. Beyond the familiar Rockies locations, David Thompson Country is a particularly wonderful area of Rockies front range terrain — lesser known but incredibly rich in photography potential. We will spend most of our field time along Highway 11 at locations close to the lodge, ranging west to Saskatchewan River Crossing. Winter time in this area offers much to photographers: fantastic clear light during short days; evening skies far from any light pollution; frozen lake ice and waterfalls; snow-covered mountains, canyons and forests; “interesting” weather; and much more. This is a perfect environment for black-and-white photography. Note: This is winter in the mountains, so be prepared to work within the cold and potentially windy conditions. Proper winter gear will be very important. We can advise group members accordingly; ask for details if you are not used to winter photography in the outdoors. Something Wickedly Windy This Way Comes, David Thompson Country. Copyright © Royce Howland. To our fantastic locations, we add a masterclass format where each day presents a combination of instructional seminars, field photography work, lab time to apply the learning, and hands-on printing to see the results. We will look at the aesthetics of B&W, and cover the full workflow: conception and capture in the field, B&W development using a variety of digital darkroom techniques and tools, and making prints with standard and alternative digital inkjet printing. Printing options will include Epson printers with both OEM K3 inks and Jon Cone K7 carbon-based inks, on a variety of fine art papers. As a take-away from the masterclass, participants will receive a comprehensive digital B&W printing workflow guide. The schedule will be intensive. Between the field work, seminars and hands-on lab work, we will be eating, drinking and breathing B&W photography and print each day. Transportation to field locations will be based on car-pooling amongst the group. We avoid excessive road miles, since the purpose is to learn, photograph and print, not to drive. Still, time in the vehicles (as well as our daily meals together) is a great chance to chat about everything photography with the workshop leaders and other group members. 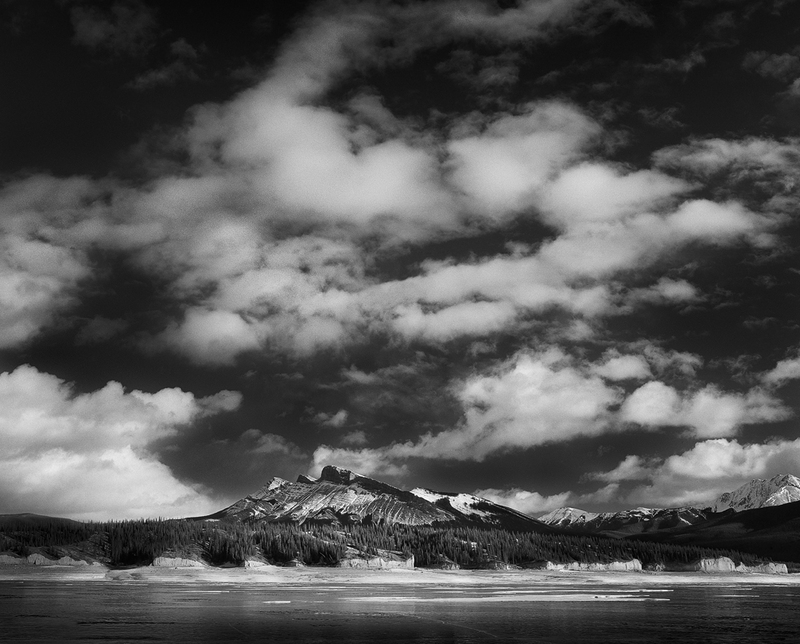 Come prepared for a time of singular focus on digital black-and-white. Click this link for a PDF describing the masterclass schedule. Kista Peak Storm. Copyright © Olivier Du Tré. 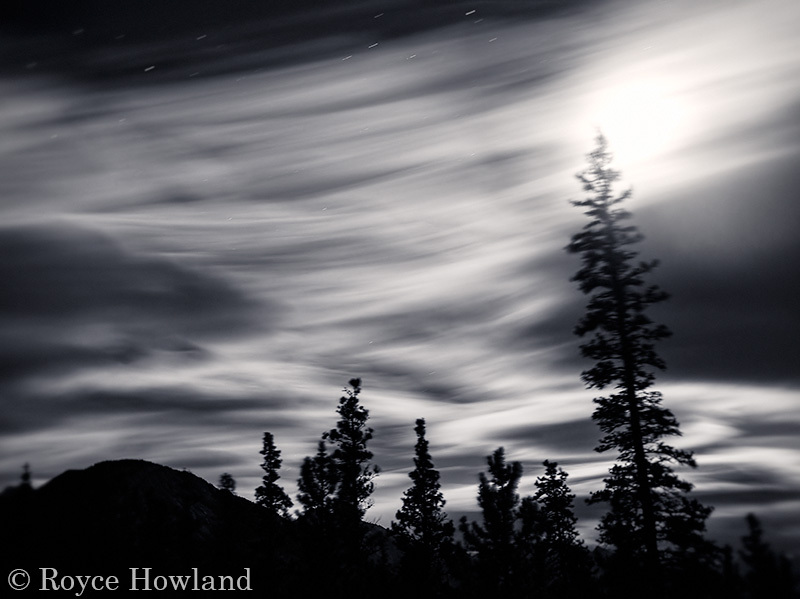 Royce Howland is a Calgary-based fine art photographer, specializing in landscapes and travel. He also writes and instructs on photography. 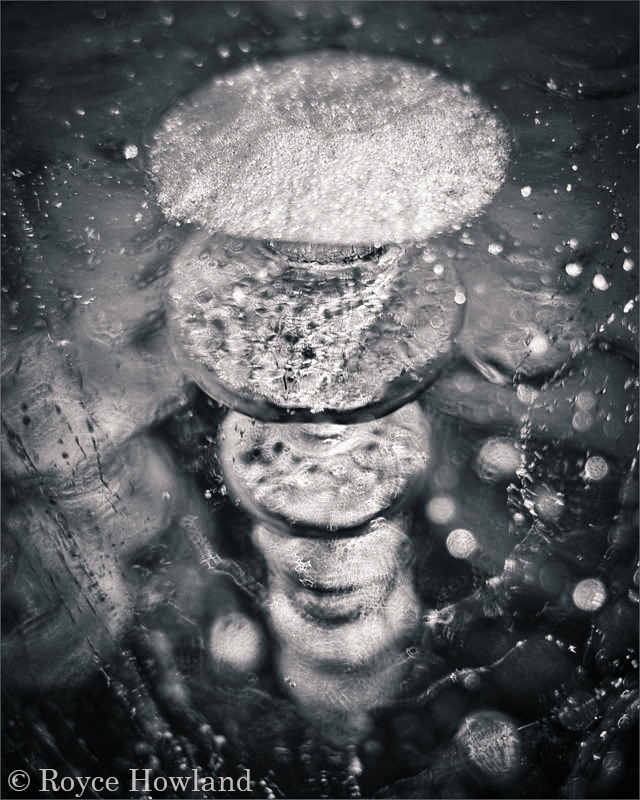 For the past several years he has been bringing black-and-white increasingly into his personal fine art work. He describes much about his approach as “high-tech old-school”. Despite being a product of the digital age, he is also passionate about printing photographs on paper, and seeks to introduce as many others as possible to the experience of photographs outside the digital monitor. An accredited member of the Professional Photographers of Canada and a juried member of the Alberta Society of Artists, Royce has been leading highly regarded photography events, including masterclasses on creative photography topics, since 2010. 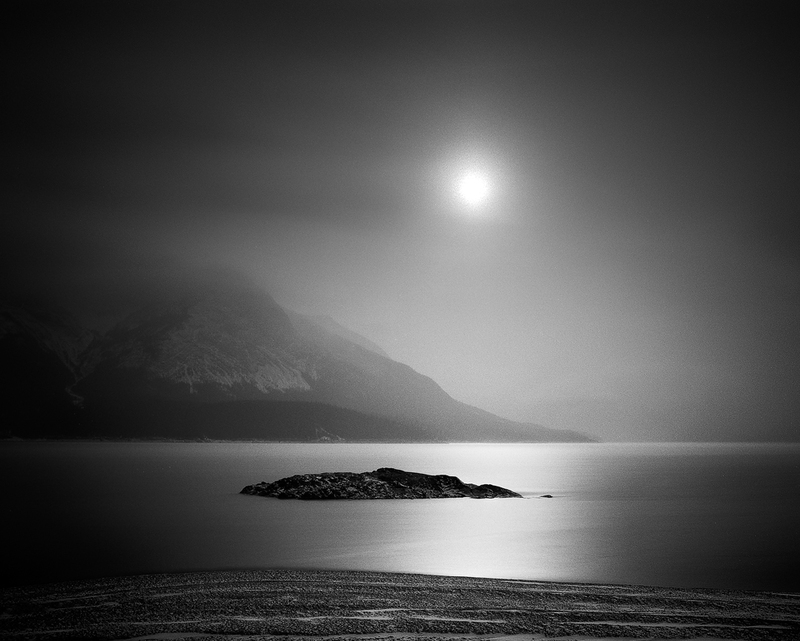 Olivier Du Tré is a Belgian/Canadian traditional fine art landscape photographer living in Cochrane, Alberta. 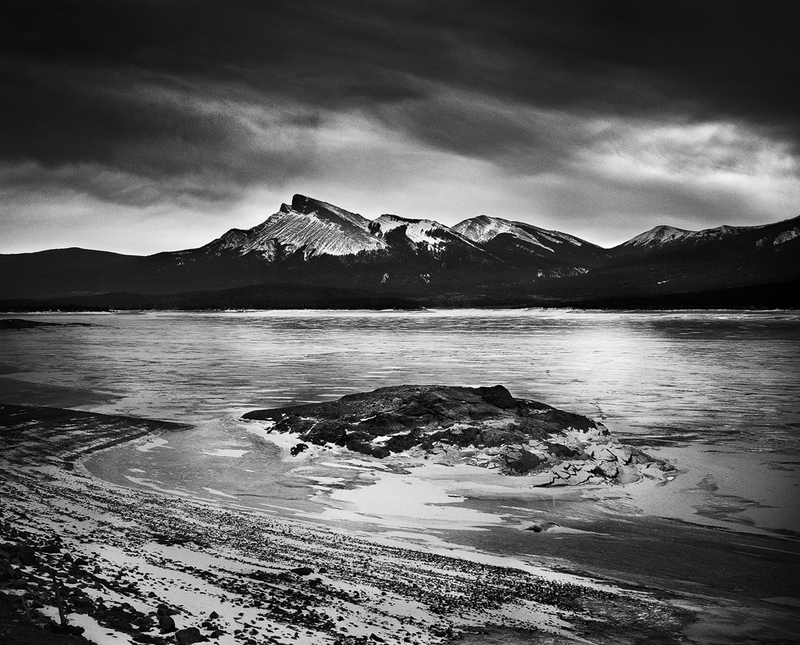 He specializes in photographing the Alberta Prairies and the majestic Rocky Mountains around him. Olivier’s work has been published in multiple online magazines, on numerous photography blogs and in printed magazines. This year alone, his work got shortlisted in the FotoFilmic ’14 competition, won a Merit in the Black & White Magazine 2014 Portfolio contest, received an honorable mention in the 2014 Stark Awards and 4 large prints were selected for the 2-year traveling show “Symbolic Landscapes”, organized by the Alberta Society of Artists. Costas Costoulas is a master printer and the creative mastermind behind Resolve Photo, the premier large format photographic and fine art digital printing service in Calgary. Black-and-white printing is a particular specialty at Resolve, using Epson printers with both the OEM K3 inkset and several variations of the Jon Cone K7 carbon inkset. 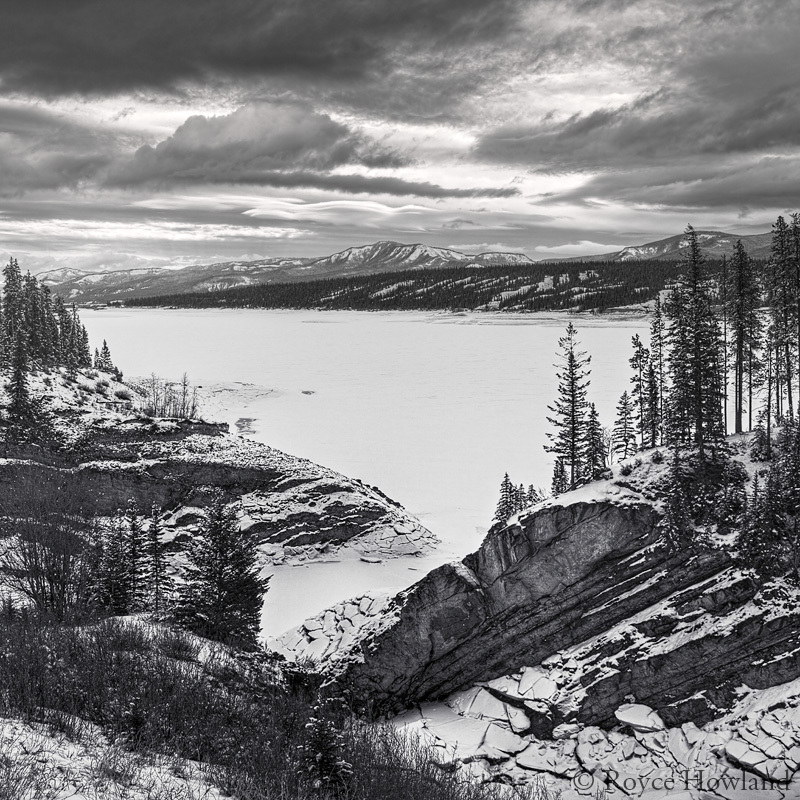 Stormy Winter Sundown, Abraham Lake. Copyright © Royce Howland. The final essential ingredient is you! Our group size will range from a minimum of 4 to a maximum of 7 photographers of intermediate to advanced skill — photographers who want to more deeply explore the art and craft of what it takes to produce exceptional B&W prints. You may be looking to re-connect with something first experienced photographing on film and printing in the chemical darkroom, or newly exploring B&W with the creative power of the digital darkroom. Either way, we are looking forward to working with a small group of photographers who are passionate about taking black-and-white photography and print to a new level. Join us for the Monochrome Masterclass! Registration is now open, and spaces are available but group size will be limited. Please contact Alan at Aurum Lodge (+1-403-721-2117) for registration, including making your deposit by Nov. 30, 2014 to qualify for the special early bird pricing. Click this link for a PDF describing the masterclass schedule. If you have any other questions, please don’t hesitate to contact Royce Howland (royce at vividaspect dot com), Olivier Du Tré (olivier at olivierdutre dot com) or Alan Ernst (info at aurumlodge dot com). 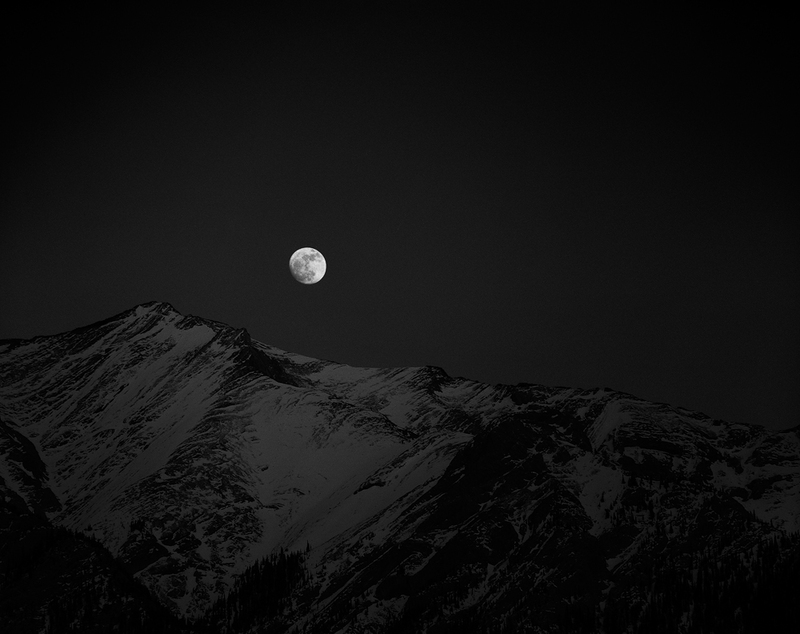 Moonrise Over Mt. Michener. Copyright © Olivier Du Tré. The Sun Is Shining… But the Ice Is Slippery, Preacher’s Point. Copyright © Royce Howland. 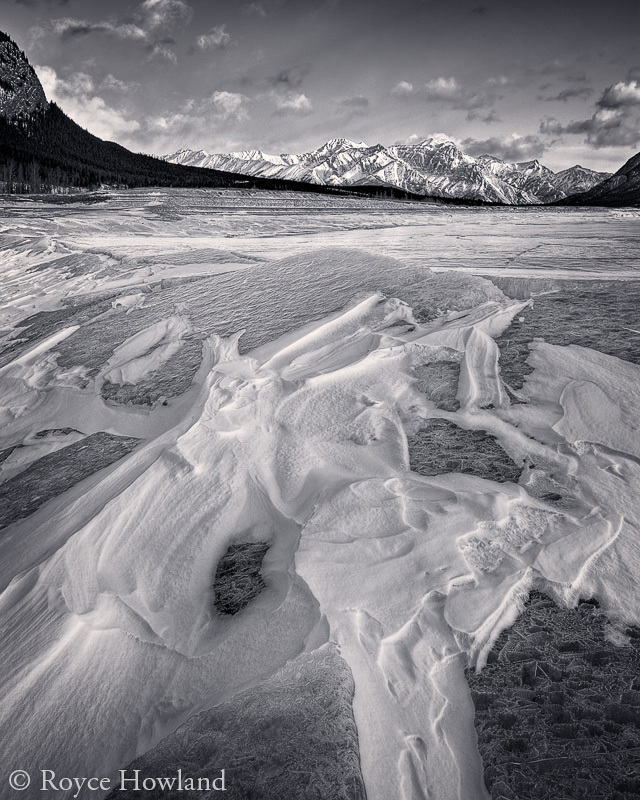 Abraham Lake Ice and Snow. Copyright © Olivier Du Tré. Erosion 7, David Thompson Country. Copyright © Royce Howland. Abraham Lake Reflection. Copyright © Olivier Du Tré. 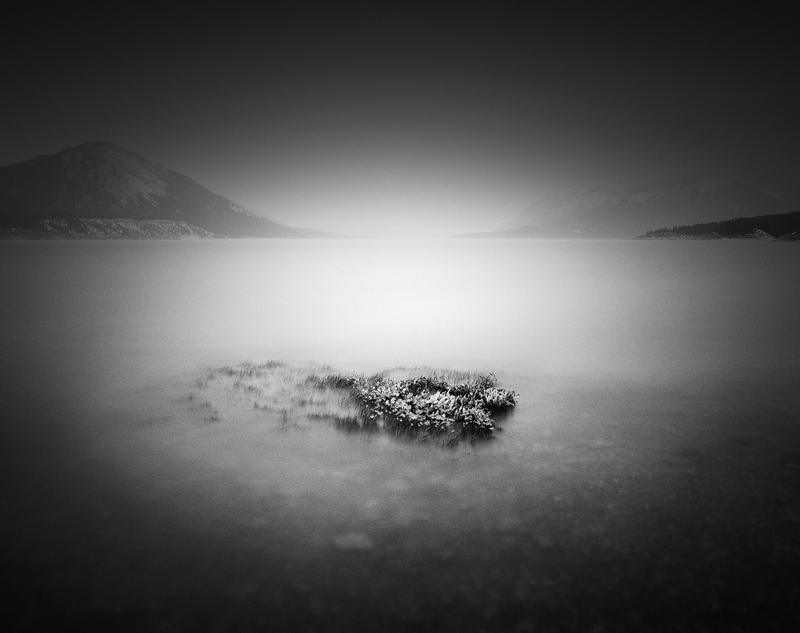 Effects of Light and Wind, Abraham Lake. Copyright © Royce Howland. Clouds Over Kista Peak. Copyright © Olivier Du Tré.